A new time is coming. With hope, heart and deep respect for both people and animals, we can create a new and beautiful future for horses and their riders. 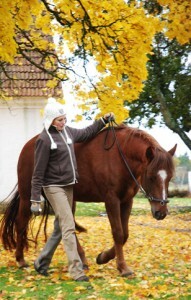 I have always been interested in training with focus on horses and humans body and mind. That is why I educated in both people and horses. Simultaneously I have trained Yoga, meditation, and Feldenkrais. I welcome you and your horse in the Riding Art of Life.